The items on this page are used and being sold “as is.” The photos of all the items were taken February 11 & 12, 2019. 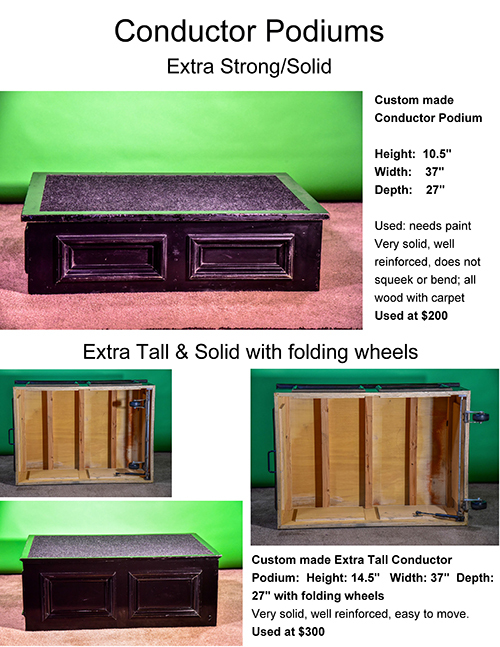 The Bass Drum and Stand are in excellent condition and are being sold only as a set. A Bass Drum beater will be included. The Tam-tam and stand are in excellent condition and are being sold only as a set. All items must be picked up by the purchaser in the Cupertino, California area. All items are used and being sold in their “as is” condition. Click on the photos below to load the Full-size photos. These are PDF files and can be downloaded. If you have questions or would be interested in purchasing, please contact Michael Gibson. Click (or Right-Click) image to expand to full-sized photo - downloadable PDF file. © Copyright 2019 BACH to Music All rights reserved.